The Wabash College Glee Club will present its Campus Concert on Sunday, April 15, at 4 p.m. in Salter Concert Hall in the Fine Arts Center. 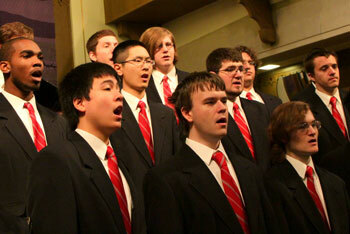 The Glee Club recently returned from its 2012 Concert Tour. The weeklong tour began in Champaign-Urbana, IL, where the group presented concerts to two retirement communities and a program at the University of Illinois Laboratory High School. The group’s stay in northwest Indiana included a program for Bishop Noll Institute High School. The tour concluded with concerts at Bethany Retirement Community and Westminster Place in Evanston IL. The 40-member Glee Club will open Sunday’s program with several sacred selections, including a setting of the American hymn tune, Hark, I Hear the Harps Eternal, and the gospel hymn, Steal Away. Rounding out the first part of the concert will be an energetic setting of the popular spiritual, Dry Bones. Wabash senior, Donovan Bisbee, will be the featured soloist in The Greenland Whale Fishery, a traditional whaler’s song. Two poets from the British Isles are represented in Robert Louis Stevenson’s, Bright is the Ring of Words and Carolina Oliphant’s Will Ye Not Come Back Again? The audience will be given the opportunity to join their voices with the Glee Club on Wabash College’s favorite songs, Old Wabash and the Alma Mater.